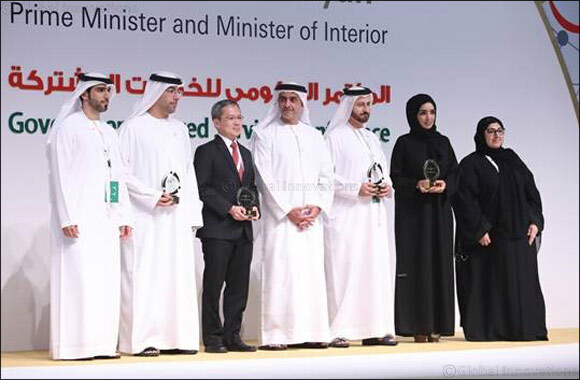 Abu Dhabi, UAE, 08 November 2018: MDC Business Management Services (BMS), wholly-owned by Mubadala Investment Company, was recently awarded ‘Best Shared Services Initiative in the UAE' at the ‘Government Shared Services Conference' organized by the Ministry of Interior. The event was hosted by Lt. General H.H Sheikh Saif bin Zayed Al Nahyan, Deputy Prime Minister and Minister of Interior. Lt. General H.H Sheikh Saif bin Zayed Al Nahyan presented the award to Nasir Al Nabhani, Chief Executive Officer of MDC BMS in an award ceremony hosted during the Government Shared Services Conference. Held recently at Etihad Towers Abu Dhabi, the ceremony was attended by senior officials and Executive Directors of national government, local and federal authorities, international experts from government and private sectors, along with several of the Ministry's officers. MDC Business Management Services was recognized for delivering optimized services across the Mubadala Group and for adapting its offering to fit the needs of Group companies while adhering to, and sharing, best practices. The participants at the ‘Government Shared Services Conference', which is a platform for exchanging international expertise and knowledge of government services, outsourcing and government shared services practices, discussed several topics and working papers related to best practice and innovation. Several government officials from the United States, and Singapore participated in the conference while leading international officials presented working papers on their experiences. Following the award ceremony, Chua Soon Guan, Chief Executive of Vital Shared Services from the Singapore Government, who was the event's guest speaker, visited MDC-BMS offices and was introduced to the company's operating model and processes.